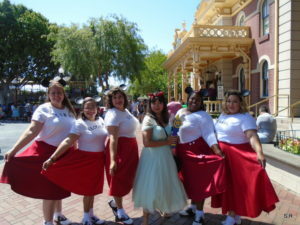 Dapper Day Spring is one of the most anticipated unofficial dress up days at Disney. So much so, it happens twice a year. 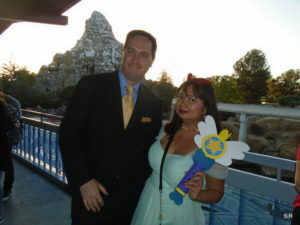 This is my third Dapper Day since moving to Orange County. It’s definitely my favorite dress up day for all of the obvious reasons. 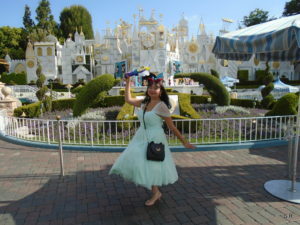 Coming from my high from Viva Las Vegas, I was excited to show off my styles and be fancy at my favorite place to visit. 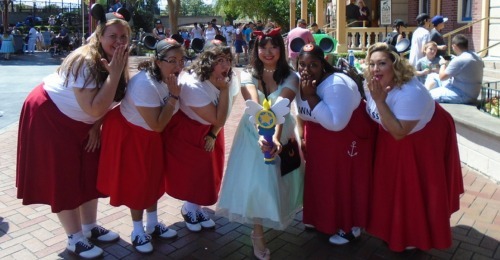 Dapper Day lasts for two days. There is a free expo where people can shop and enjoy some adult libations to live music. 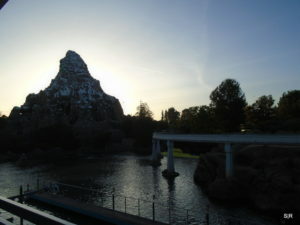 Sunday is the day to visit the parks. 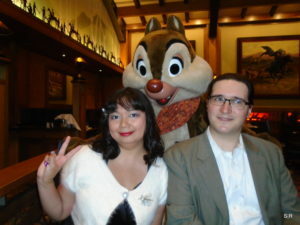 For the past couple of Dapper Days, I’ve noticed a trend in integrating Disneybound in the outfits. 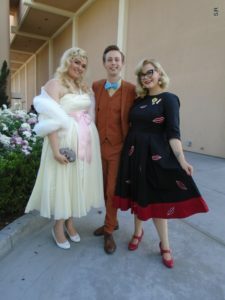 I did my last two Dapper Days in regular 1940s style clothes from Tatyana Boutique and Stop Staring. This time, I wanted to do something different. 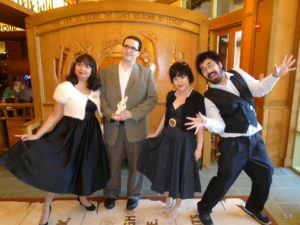 The Scarlet Rhapsody team went for both days for Dapper Day. 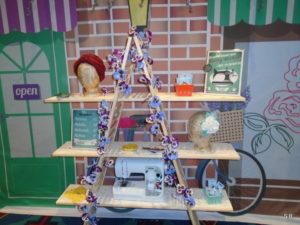 We spent the first day at Storyteller’s Cafe and the expo. 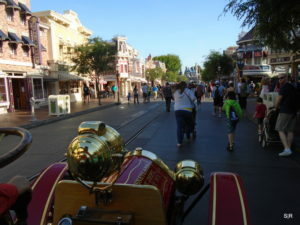 The second day was spent in the parks. 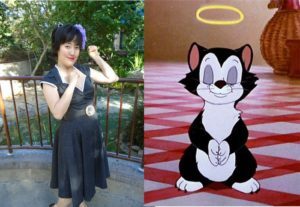 Our podcast co-host, Deb, as Figaro. 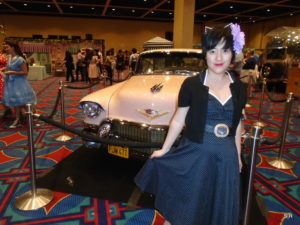 She is wearing a dress from Pinup Girl Clothing. 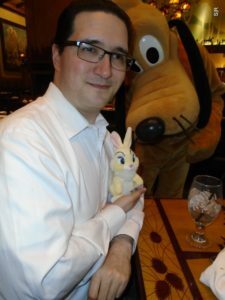 Our copy editor, Jared, as Thumper. 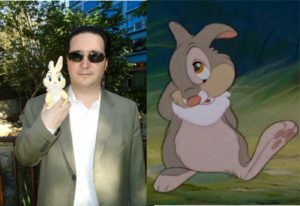 He wanted to make Thumper to step out of a 1980s cop drama. This was one of his first bounds. I found a Honey Bunny plush while sorting through old toys in my attic. I bounded as Star Butterfly from Star vs. the Forces of Evil on Sunday. 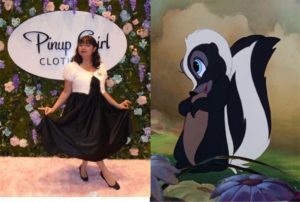 The dress is a garden state from Unique Vintage. The jewelry is from Pink Collar Life. 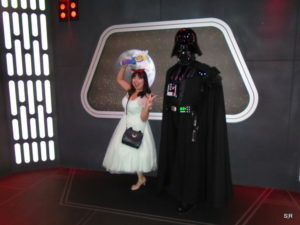 The hand bag and headband are from Pip Star Pop. I made the wand. 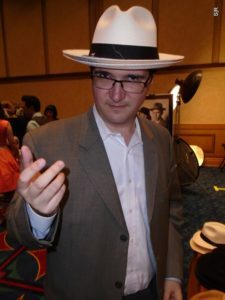 Our podcast co-host and site contributor, Stan, as Lucifer from Cinderella. He also bounded as Lucifer the last time we went. It’s funny because Stan is a dog person. 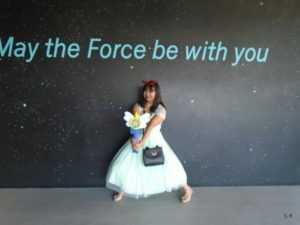 I bounded to the expo as Flower from Bambi. The caplet is from H&M. The dress is from Stop Staring. 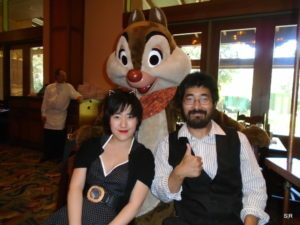 Because of the Scarlet Rhapsody squad don’t have annual passes, we decided to spend Saturday at Storytellers Cafe. 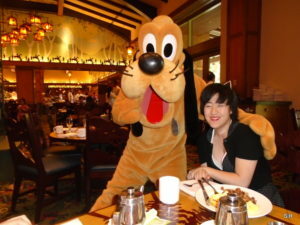 It”s one of the three restaurants outside the park that have character dinning. 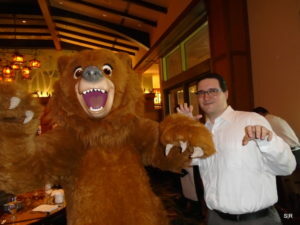 While character dinning is aimed at younger guests, you only have to be young at heart. 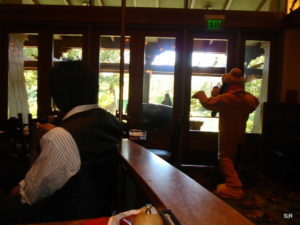 For Storytellers Cafe, they were focused on Chip, Dale, that bear from Brother Bear (I mistook him for Humphrey from the original Disney shorts), and Pluto. 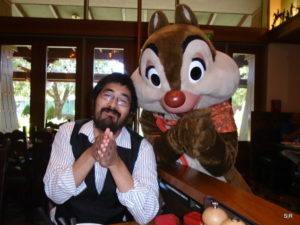 Not as many characters as Goofy’s Kitchen, but it was fun to interact and hug these guys. The food was actually really good. 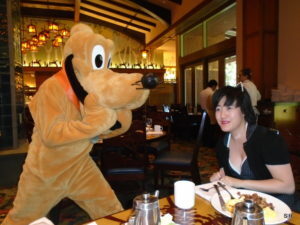 I kept reading mixed reviews about Storytellers Cafe. I could eat the seared salmon for days. We went during brunch which had an omelette station. The price per person came around to $33 before tax and tip. Annual pass discount is also taken into consideration. 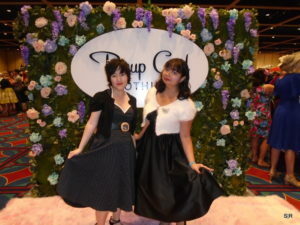 Dapper Day Expo is a free event that is held at the Disneyland Hotel convention center. It was about the same size from previous years. I liked that it was indoors and that you can cool off with water. 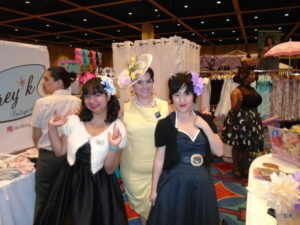 I saw a lot of my friends from the pinup and Viva scene at the vendors hall. 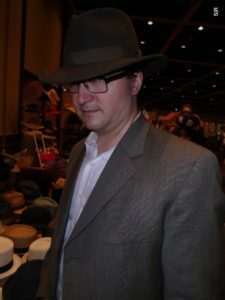 Essentially, this was a huge shopping area for all things vintage, retro, and pinup. 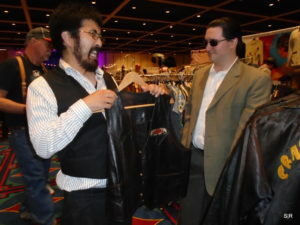 There was a huge selection from different eras and decades. Prices depended on which booth you went to. 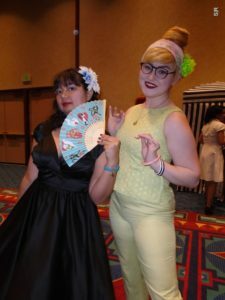 Need yellow shoes for Disneybounding? Sidecca has you covered. Deb and I are Besame Girls! 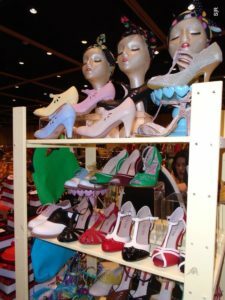 Stopping by Pinup Girl Clothing. 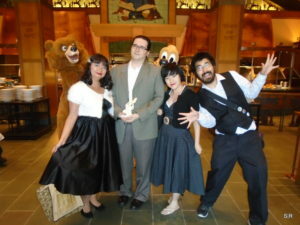 They are mostly known for Mary Blair prints and hosting Pinup Parade in the Park. 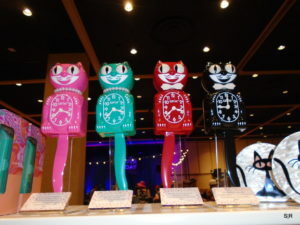 Audrey K Boutique also sold kitschy retro house accessories like these cats. Jared says they’re dumb, but I can’t say no to these cats. Meeting Nico of Niccoco Creations. Deb and I bought these hair accessories from her. 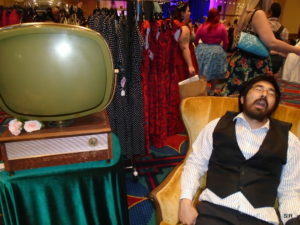 Stan at Pinup Girl Clothing’s boyfriend buttrest zone. 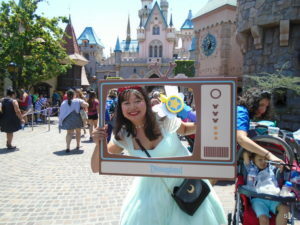 The TV was playing Disneyland’s opening day broadcast. Having Viva flashbacks posing with cars. 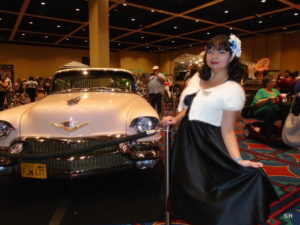 Dapper Day used to have a car show. Kinda miss it. With Kara Spade from Double Trouble. We’re already making Viva 21 plans! 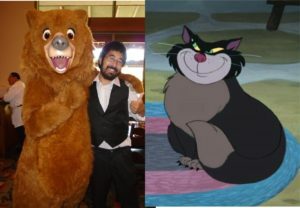 Saw these Aristocats Disneybounders outside the Disneyland Hotel convention center. More fun with Double Trouble! 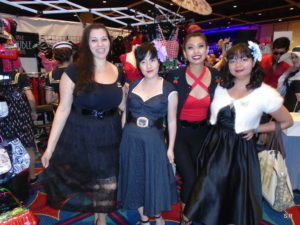 Rockin’ Bettie Las Vegas – one of my favorite places to shop for basics like peasant blouses, skirts, belts, etc. 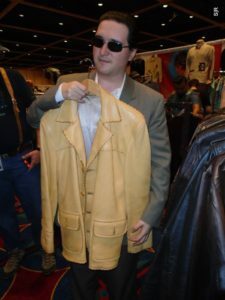 Jared shopping at Blue Moon Vintage. 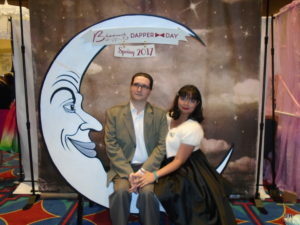 Dapper Day took place on Sunday, April 23. It wasn’t too crowded. 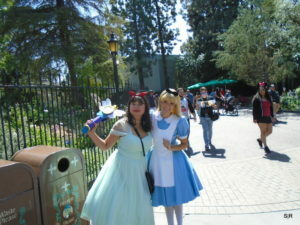 Most waits for attractions were around 30 minutes. Not bad for a Sunday crowd. 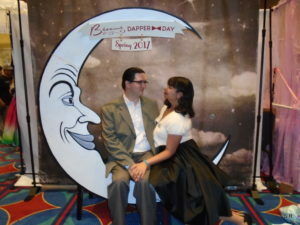 I loved seeing everyone’s dapper themed bounds. 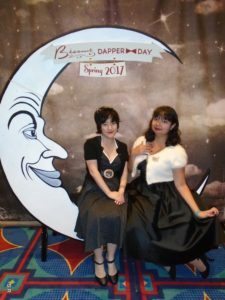 I like the variety of fanciful decades – flappers, old Hollywood, Gatsby inspired, rockabilly, 1950s opening day, 1950s sweethearts, etc. It’s always nice seeing everyone dressed up! 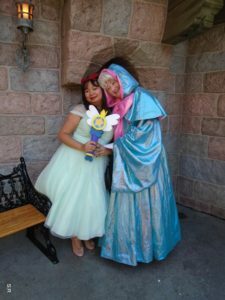 Most themed bounds I spotted were from Cinderella, Han and Leia, Beauty and the Beast, Aristocats, and Sleeping Beauty. 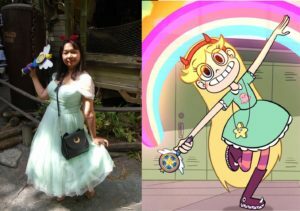 I had very few people recognize my Star Butterfly – I know that Disney XD shows don’t get much love, but Star Butterfly has been my favorite animated character of recent times. She’s like a Japanese magical girl, but for Western audiences. And what other princess uses magical powers (other than Elsa)? Spending time with one of my new friends! 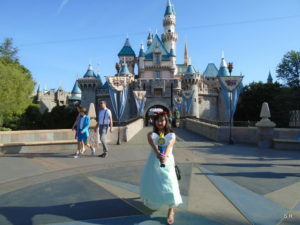 Obligatory castle photo – I got mine during the morning when there wasn’t a huge line for it. 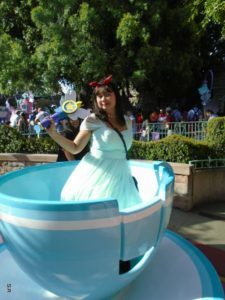 Star would find herself in a teacup if she went into another dimension! One of the scariest dimensions of them all…don’t drink the water. Jumped into this dimension with this scary guy who was looking for people to help him achieve his dreams. I LOVE HELPING PEOPLE! Underwater dimension where the fish can talk. Been there, done that! I made another new friend. This is Alice. She’s also jumped into another dimension. The dimension of Wonderland – it’s a lot like Mewni, but I don’t agree with their stance on capital punishment. 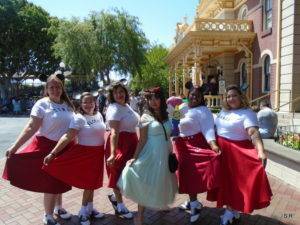 With the ladies of Disney Fans and Annual Passholders! 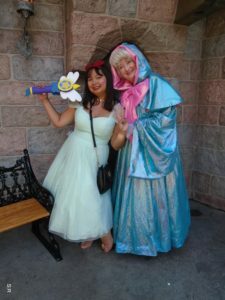 Met the Fairy Godmother in the Fantasyland dimension. She also uses magic! OMG! 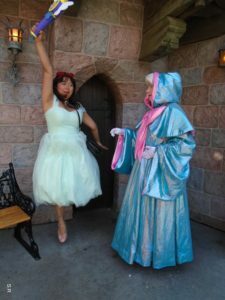 She wanted me to cast a “Bibbity Bobbity Boo” spell, but she thinks I’m too high on pixie dust. What a nice old lady! Checking out It’s a Small World again. Remind me to wear shades anytime I exit the ride. Meeting sunlight again is the very definition of pain. 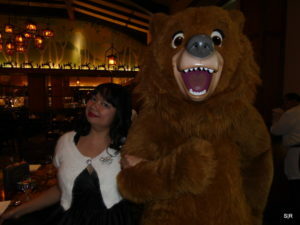 Originally themed after Pinocchio, Red Rose Tavern opened in late March in celebration of the live action Beauty and the Beast movie. This replaces Village Haus. 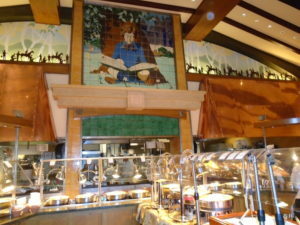 It was your standard lunch place in Fantasyland – pizza and burgers with Pinocchio murals. 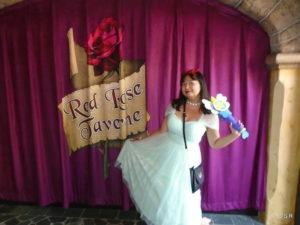 Now that it is the Red Rose Tavern, Gaston’s watering hole, it’s themed to Beauty and the Beast. 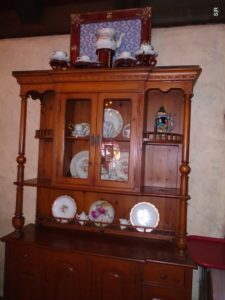 The tavern has decor and references to the live action, animated, and musical tellings of the tale as old as time. When I sat down, I noticed they they were playing music from the Broadway musical. 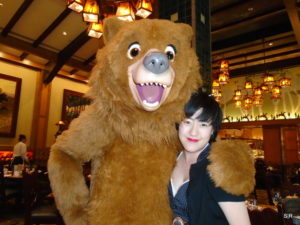 It brought back memories to the time when I saw Susan Egan as Belle. 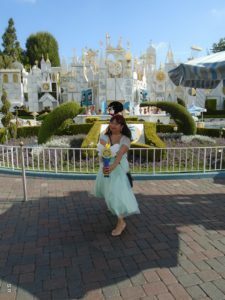 Wearing high heels to the parks was a mistake. Even if I wanted to accurately bound as Star with the right colors, it wasn’t worth it. 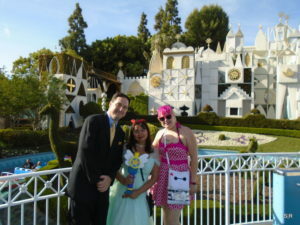 I thought I could pull off Dapper Day even in low heels, but not the case here. 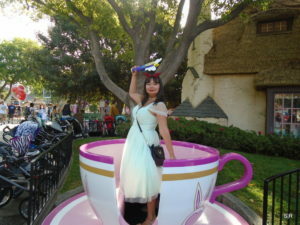 I think wearing tea party flats would be a much better idea the next time I hit up the parks dressed up fancy. 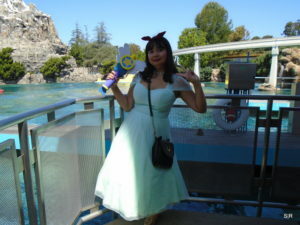 While I do dress up in retro fashion anytime I visit the parks, it’s just nice to have a day where people are also dressed fancy and also understand your quirky interests in modern vintage style. I felt very drained at the end of the day, but it was well worth it! The Expo was tons of fun as always. I always like seeing what new things people have to sell. 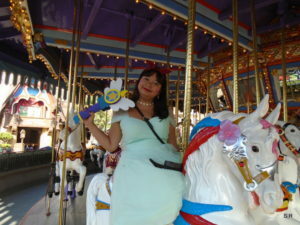 Many thanks to Jared, Kara, Nico, Audrey, Dave, Deb, Stan, K Star, and everyone I ran into at Spring Dapper Day. 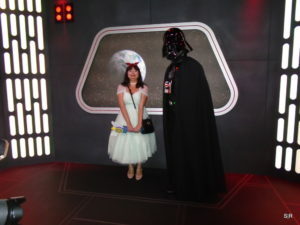 I’m looking forward to future Disney dress up days. I might make it to Star Wars Day during the day time and finally rock 1960s secretary Wedge Antilles. If not, I got yet another obscure bound for Pinup Parade in the Park!